I’m going to do something a little different today and head back to my “mama blogger” roots. I’ve been meaning to write an article on nursery organization for the better part of a year now, but ya know…kids and work and life. I do have some insight to share about this particular topic, because I live in a small house and I have two small babes. I had to make the most of a small nursery room for two babies under two, and I’m here to share those tips with you mamas that are reading this today. If you landed here by coincidence and you’re not a mom, you can head over to my recent blogging articles here and here. Now, let’s get to it. My top three tips for nursery organization with two small babies! 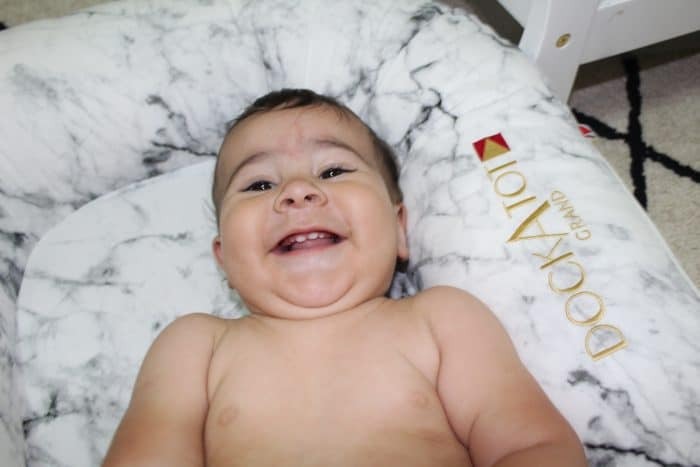 Thank you to Lorena Canals Rugs and Dock-a-Tot for partnering with me on this post! This post may contain affiliate links, which means I make a small commission if you click on these links and make a purchase. You can read my full disclosure here. 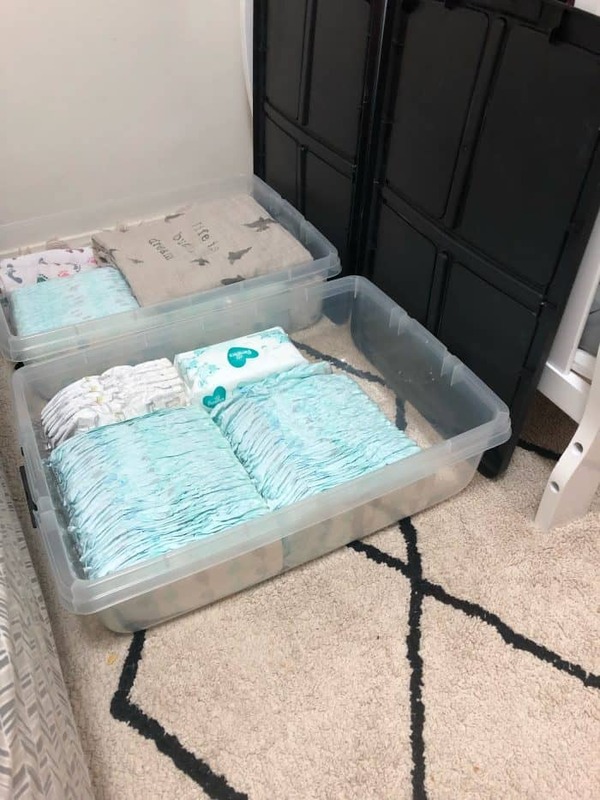 I have the perfect amount of space under my crib for two plastic tubs with lids. I fill those tubs with diapers, wipes, cloth nappies, bibs, burp cloths, etc. That is probably the best tip that I could possibly give you! Somehow, someway, find a little bit of hidden space and take advantage of it. 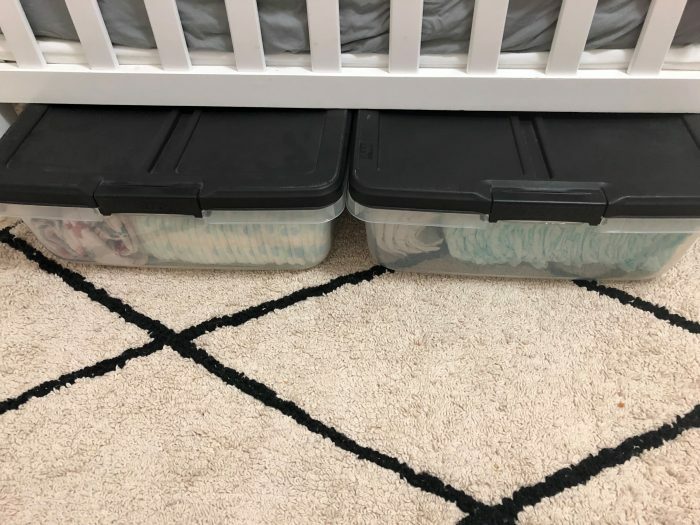 This tip is pretty self explanatory, but here’s a shot of my under-crib storage for reference! We keep our books up on wall shelves and a net full of stuffed animals in the far corner of the room. This allows us to keep all of the clutter up off the floor. We just pull down a few books and toys at a time, and then put them all away when we’re done. I’d like to say that we’re extreme minimalists that are content with just a few toys, but we’re not. 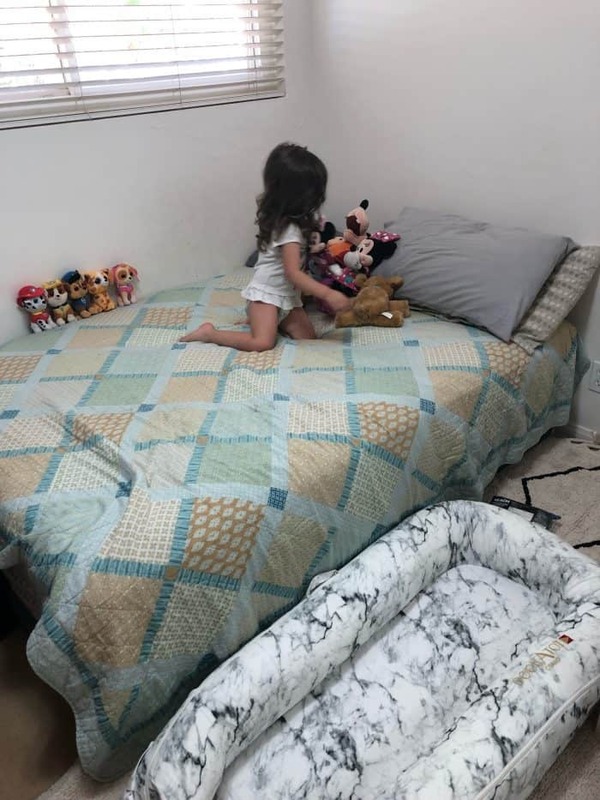 My husband and my toddler are borderline hoarders, and as much as it drives me crazy, I’m too tired to fight them…Emma will quite literally take toys out of the trash and put them back in her toy bin if she spots them. Do your kids do that?? 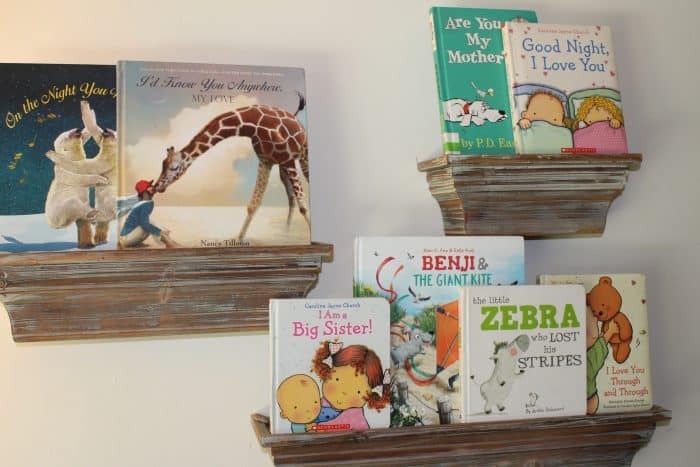 Regardless, not every nursery will be super organized or clutter free, and that’s okay! If you’re trying to make the most of your small nursery though, taking advantage of vertical space is a great start. So, here’s my third and final (and favorite) tip of the day. 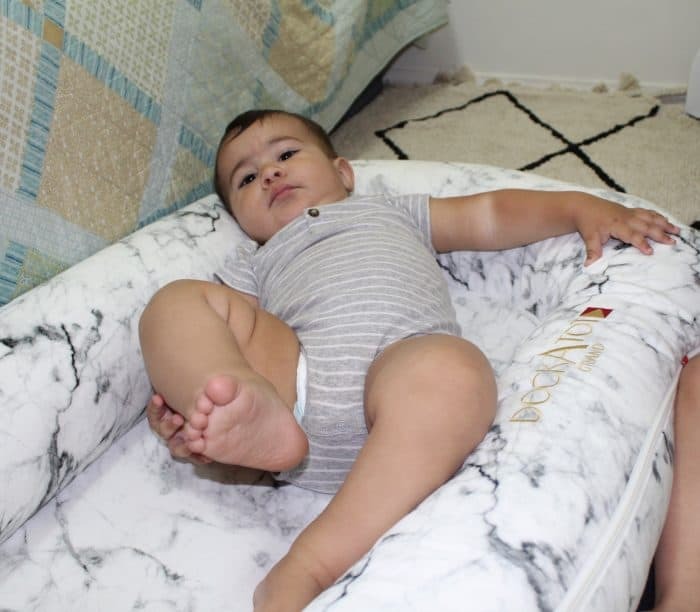 Choose a few select pieces that make everything in the nursery comfy and cozy. Trust me: you and your littles will probably be spending a lot of time in this room and you want it to be comfortable! 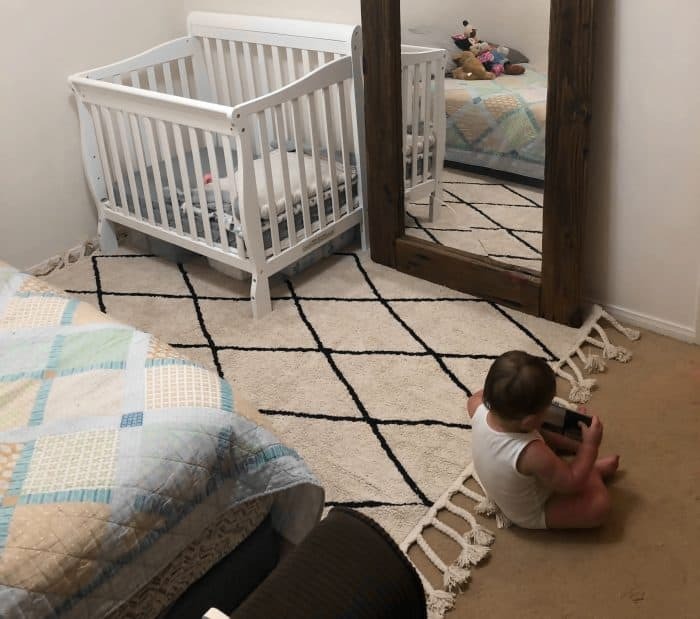 This beautiful rug took my nursery from boring and bland to comfy and cozy. It’s soft, it’s stylish, and it can be washed in my washing machine at home…which makes it a keeper in my book. I have two chunky babies and they love a secure place to snooze, cuddle, and lounge. The Dock-a-Tot Grand is the perfect nursery lounger for my sweet babes. 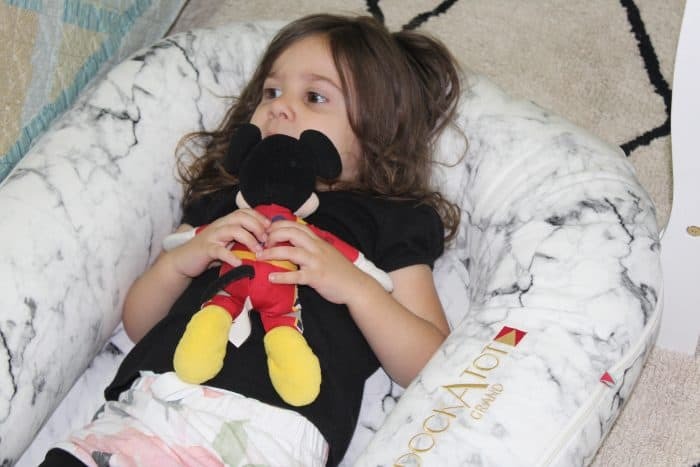 It’s easy to store behind the crib or the rocking chair, or even just laid out on the bed. I have a well-loved rocking chair that has been my home for the better part of 3 years. 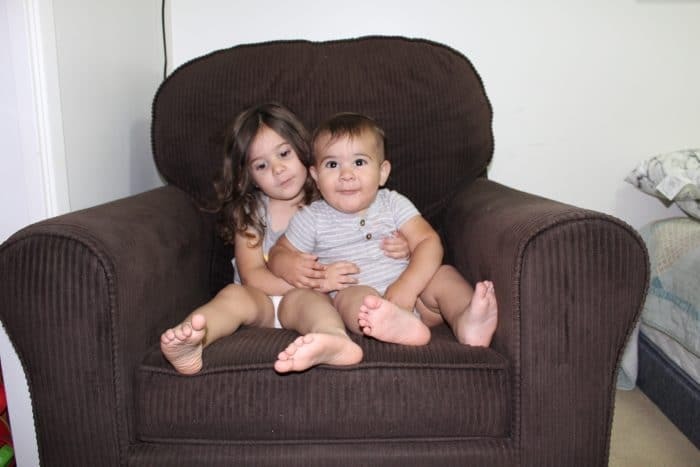 I have nursed my two babies for a total of 25 long months, and so many long nights were spent in that comfy chair. It’s BIG compared to the nursery space, but that doesn’t bother me at all. 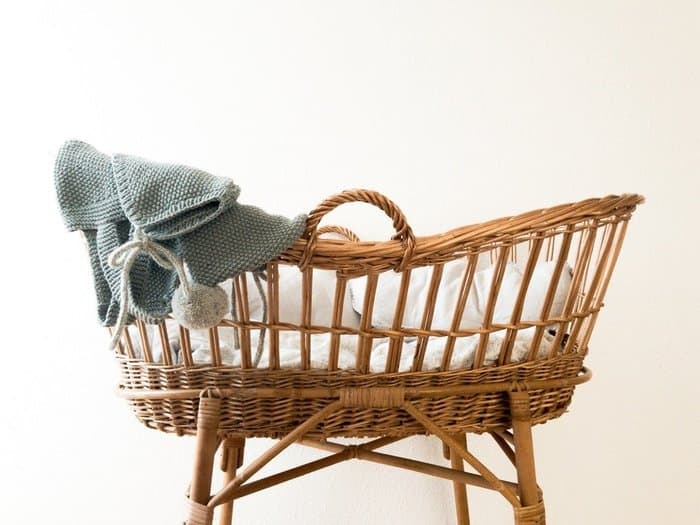 A rocking chair is a must-have nursery item, no matter the size of the room. Don’t shy away from hidden storage space, vertical space, and comfy nursery décor. Those are the few things that will turn this room into a pleasant place for family memories and sweet baby snuggles. There are so many more important things to worry about that cleaning house and stressing over space. I’m proud to say we chose a small home and make due with a small nursery, so that we can focus on more important things. Easy to organize, easy to clean, easy to pay for, and easy to live in! Now tell me! What are your nursery room hacks? Share all your secrets in the comments!